It has been a while since I have posted a report on Norfork Lake, but after another visit to see the grandkids, I am back fishing and the fishing has been pretty good. One of the best things about Norfork Lake is the diversity in fish species. 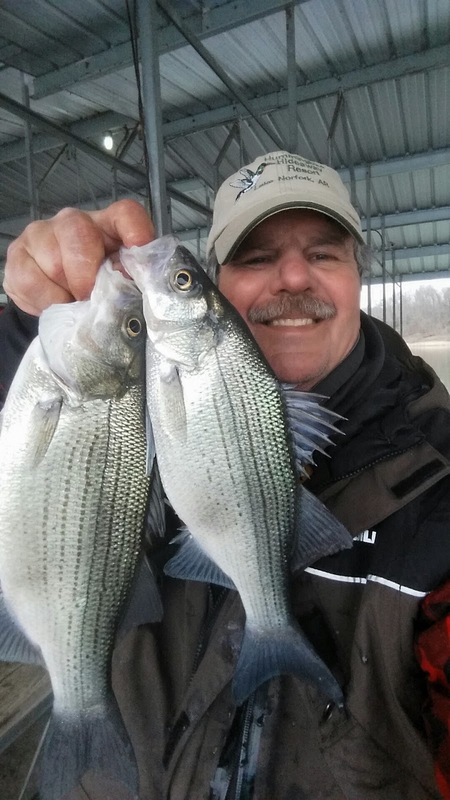 If you have followed my reports you know I love to fish for striped bass, hybrid bass and white bass, but if the bite is slow for these species you can switch up and go bass fishing, crappie fishing, walleye fishing or catfishing. The white bass bite continues to be outstanding. You can find white bass on the large flats. A couple flats I have fished over the last week are the Cranfield Island flat and the flat east of Howard Cove (locally named Big Sandy) and at times the 101 bridge flat. The best depths have been from 35 - 55 feet of water and the fish are at all depths. 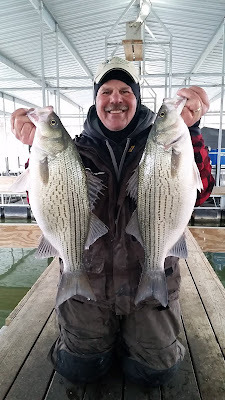 Feeding with the whites are hybrid bass and striped bass. Vertical jigging a spoon or casting out a blade type bait, such as a Kastmaster, are both working well for me. Most days you can catch a boat full, but of course the changing weather patterns affect the bite of all species. I have also had luck finding and catching a few nice striped bass in deeper water. 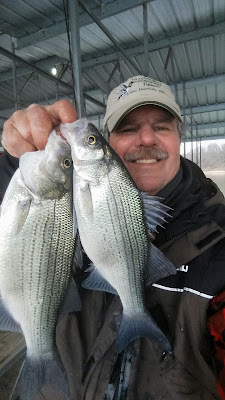 I have found scattered stripers on the deep flats outside of deep water channels. These fish have been 40 - 50 deep and I typically only see a few fish at a time. 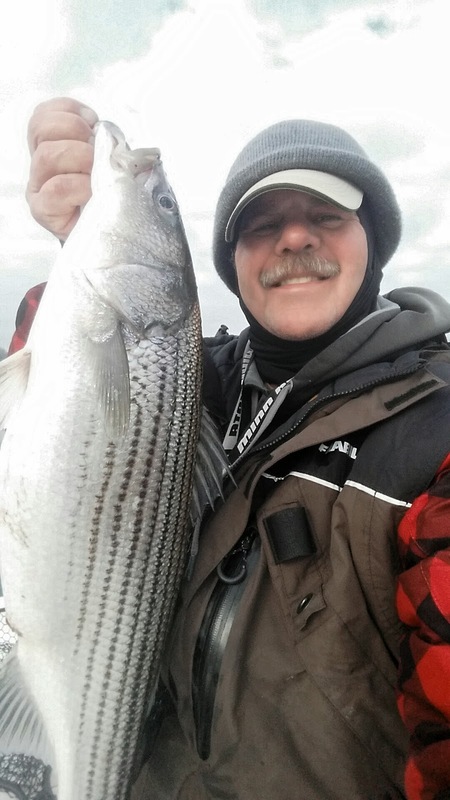 Several nice size stripers have been caught by jigging a spoon, as well as, by trolling an umbrella rig. 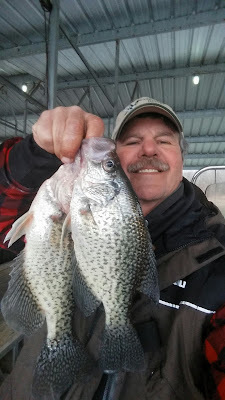 The crappie bite has also been good over the last week. The best location for crappie are inside one of the newly refurbished Arkansas Game & Fish Commission's fish attractors. I don't remember the exact number, but this group did an incredible job of refurbishing roughly 180 sites on Norfork Lake. I can personally attest that these new brush piles are holding big fish and not just crappie. The crappie that I have caught have been at the bottom of the brush in about 30 feet of water. They do tend to come up off the bottom in the late afternoon following the bait. I have been using a 1/4 spoon to catch my crappie, but small grubs (you can tip it with a crappie minnow) are working as well. You can also use live bait with a slip float to catch your fish. 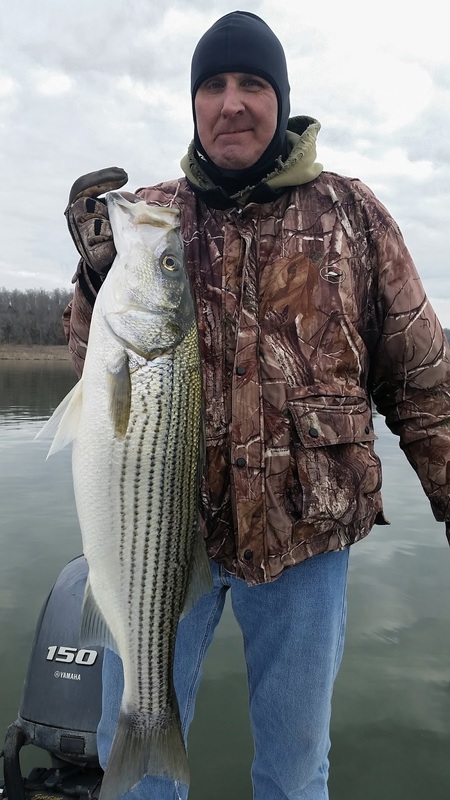 The largemouth and spotted bass bite has also been very good over the last week. The bass I have caught are also buried in the brush. The depth of the fish changes daily and lately 40 feet has been the magic number, but this afternoon I caught several 30 feet down on the bottom. Deep diving crank baits, as well as, plastics are working well. Lure action has been the best on the points of bluff line walls or where the bluff wall changes to chunk rock. Norfork Lake level is falling slowly when the dam is generating and currently sits at 553.98. This level is slightly higher than the current normal seasonal pool. Most of the lake is somewhat stained, but I can see that the main lake is starting to clear nicely. The surface water temperature this morning ranged from 45 to 47 degrees depending on where I was fishing. I covered a lot of water this morning. I started in the Cranfield area then headed back to the Howard Cove area, then moved farther back into Bennents by Fouts Marina. I caught some fish everywhere I fished, mainly white bass and largemouth bass.